The other day, a group of dog lovers and their dogs met at Gallup Park in Ann Arbor, Michigan to participate in a group dog walk. The dogs in the group are considered “green light” dogs, meaning they are friendly with other dogs and people. 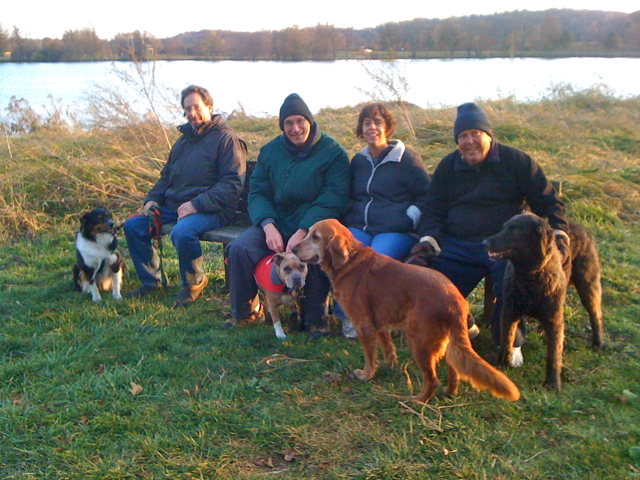 The group’s intent is to provide ongoing socialization and exercise for their dogs. During the walk, the group commonly pass other dog owners and their dogs that are unknown to them. A common exchange occurs such as asking if the dogs are friendly and if so can they meet each other. If the answer is yes, the dogs are allowed to meet and greet each other while on leash (due to park leash laws and the lack of a fenced in area). Many of the group members have previously participated in group dog classes or private dog training so they are well versed in recognizing stress behaviors in their dogs. If they see their dog exhibit stress behaviors such as muscles tensing, body posturing toward or away from other dogs, ear carriage going from normal relaxed carry to forward or back, breathing changing from normal to paused, etc., they know how to safely move their dog away from the other dogs to create a safety distance between them. In this instance, the group member dogs were not stressed and they were enthusiastically and appropriately greeting an unknown dog. It was the unknown dog that was exhibiting the stress behaviors. However, it initially went unnoticed because the group members were focusing on watching only their own dogs’ reactions. The group leader was present and requested the members to pull their dogs away from the unknown dog. The greater distance between the dogs lowered the unknown dog’s stress level and therefore, prevented the situation from escalating. And, it was an excellent learning opportunity for the group members. They took a moment to discuss the situation before completing their walk. They realized they didn’t see the unknown dog’s behavior change because they were looking at their own dogs. The moral of the story is that even if your dog is the most polite and outgoing dog there is, you must watch for behavior changes not only in your own dog but also of the unknown dog to keep every one safe and stress free. Not every dog is ready to go nose to nose with other friendly dogs. The unknown dog’s needs should also be considered as to when it is safe for dogs to meet and greet each other. This entry was posted in Dog Training Tips and tagged dog aggression, dog behavior, dog hikes, dog walking, dog walks. Bookmark the permalink.